Can you imagine a vacation in ideal quiet surroundings, with an astonishing nature, where you can wake up to the sound of birds singing and the trickling of water running through the lake of the mill. Then Borbjerg Mill Inn is the place. The majority of rooms have a pleasant view over the lake, stream or meadow, where the Inn’s animals grass (lamas, emus, south African mountain goats, horses, donkeys, geese and nose bears) and where there is situated a 9 whole golf course. Furthermore we have handicap friendly surroundings. Our 27 room accommodation is situated in the old guest stables and are of different size and standard with access to free wireless internet. 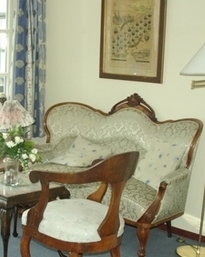 All of the rooms have been individually prepared after famous places and people e.g. H.C. Andersen, Livingstone, Kaj Munk, Skagen,Swaziland, Karen Blixen, King Ming and Columbus. Three of our romantic rooms are furnished with lavish bathrooms with a Jacuzzi. In our kitchen our experienced chefs prepare delicious menus from special orders for food lovers to more traditional menus. We value the old mill traditions, which consists of hospitality, good food and drink and professional service. From the Restaurant there is a breathtaking view over the Mill​Lake. Weather permitting we serve both on the patio and the inner court of the Inn. Whether it be family or company parties, then Borbjerg Mill Inn is the number one choice. Our professional expertise good meals and picturesque surroundings are the perfect cocktail which has made us a popular place to hold your party. We also deliver takeaways! Borbjerg Mill Inn is the perfect setting for coach-parties and group excursions. The area offers a lot of features so remember to reserve time to plan your excursion. We will be delighted to tell you about the Mills history. We have a special menu just for coach parties and group excursions including typical local menus from the Danish kitchen. A Boma is an octagonal wooden pail house in typical African style. The house is built on wooden poles with a terrace which hangs over the Lakeof the Mill. Without a doubt you will experience the feeling of being far out in the bush, as the house is situated in unique and beautiful surroundings. The route to the Boma is made up of thicket along a sandy jungle path, which was earlier a peat bog area. These surroundings make a heaven for birds. The choir of birds, combined with the animal pen, completes this exceptional nature experience. In the BOMA there is place for 20 hammocks, which hang from the large supporting middle pole in the house. Along the outer walls there are fitted benches, which can be converted to sleeping areas at night. The house is open at the sides, which gives you the opportunity to saviour the view of the nature, which surrounds the Boma. In case of rain or rough weather the house can be closed with the help of waterproof linen, which can be rolled down the outer walls of the house. The Boma is furnished with African furniture and there is a fireplace on the terrace by the lake. The Boma can also be used for a party hall. KUBUKA means good view, which is a given fact for the luxurious tents situated in the old beech wood. At the plateau high up in the trees, we have pitched a number of safari tents with a beautiful view over the MillLake. The tents are fitted like hotel rooms with a primitive toilet- and bathing facilities. Here you have the opportunity to experience the perfect African bush atmosphere. In our safari car “Africa’s Queen II”, which is situated beside the little bridge at the Mill lake, you can enjoy a light meal with a view of the sun setting over the Mill​Lake.